A new set of leaks regarding the upcoming Nokia 9 have surfaced online. Thanks to Slash Leaks, we now know the design layout of Nokia 9’s front side and sadly it’s something that you won’t expect from a 2019 smartphone. The bezels are thick on all corners, specially on the top and bottom, that too at a time when most smartphone OEMs are eliminating bezels entirely. Although they are not as thick as the ones on Nokia 8, but going forward to next year these will feel rather dated. Apart from this, you’ll notice the speaker grill on the top bezel along with the camera cutout on the right side and space for other sensors on the left. There’s nothing to say about the bottom bezel apart from the fact that it’s strikingly large and doesn’t house anything (and if you’re wondering why it’s there, you’re not alone). However, one feature which has been confirmed by this is the in-display fingerprint sensor. There’s no cutout for it on the front side and neither did we see any on the back side in previous leaks and renders. Other highlights of the Nokia flagship include a Penta-lens camera and an all-glass back panel. 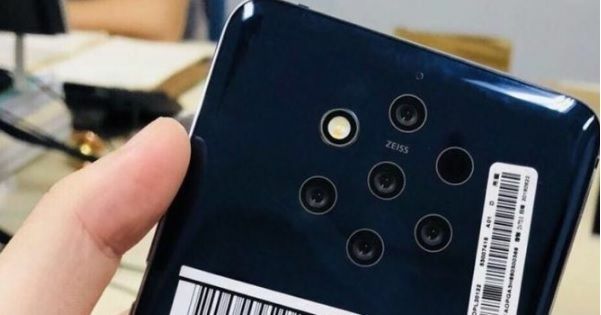 Although no one knows what this setup will accomplish, Nokia 9 will be the first smartphone to feature so many lenses. In terms of specifications, previous reports have suggested that the Nokia 9 will be powered by the Snapdragon 845 processor coupled with 8GB of RAM and 256GB storage. It will sport a 6-inch display, 4,150mAh battery and run on Android Pie. HMD Global was earlier planning to launch the phone this year but due to certain issues with the camera development, the launch date was pushed to next year.